Over the next two years, $3.8 billion is scheduled to flow into Maryland through the federal American Recovery and Reinvestment Act. A new report from the Job Opportunities Task Force (JOTF) describes how key provisions of the Act will benefit struggling low-wage and unemployed Marylanders. The report cautions that while it is important to stimulate the economy by spending funds quickly, state and local leaders must ensure that funds are spent effectively, targeting workers with limited skills and job opportunities. 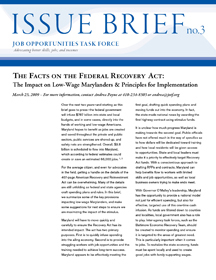 The report outlines provisions of the Recovery Act that provide direct assistance to Maryland residents, describes job creation expected to result from the Act, explains how the Act is helping the state close budget gaps, and touches on funding streams that Maryland will have to act on soon in order to access. The report also highlights principles that state and local leaders should adopt to ensure an effective, transparent, and accountable implementation of the Recovery Act.